When did G1 end for you? Well, more 'what were the warning signs', either looking back or that you felt was a warning sign at the time? This is not an attack on G2, nor is this an attack on lines/characters/movies that you like! Heck, I'm going to name my own, but I like other aspects related to the 'warning sign' that I half-saw at the time, half-realise afterwards. I see this kind of thing pop up in other toy lines whenever generations wind down or looks to end (think many people discussing G4 MLP for example, ranging from Faust leaving being the 'end', to Cadence/Princess Twilight/Flurry Heart/addition of Starlight Glimmer/introduction of EQ reasonings). For me, two things stand out. First is aspects of Monster Exchange; verrry specifically, Batsy Claro's odd mix of colours and terrible spirograph-like wings. I didn't expect characters like Lorna or Kjersti to come back after first doll, but they were okay. Marisol's colours were also pretty horrible to me, but she had a good gimmick and an interesting tie to MH. Second was the Ghouls Getaway line. Tiki-inspired ghouls? Sounds okay, almost like a missed Skull Shores line, but the sheer amount of huge pieces of unpainted, tacky plastic REALLY put me off. And the fact it seemed to be random characters! I consider Shriek Wreaked a hybrid G1/G2 line and don't really include that ... that line had huuuuge potential, especially with old-school Sailor Jerry-style fabric patterns, yes please! What were your warning signs? Re: When did G1 end for you? Shelf sitting was a big one. Cases would be gone so fast, and then all of a sudden, you get your pick of a case. Shelf sitting definitely comes from oversaturation. The pumping out of so many so fast, and I'm seeing it in Shoppies here now, gets people bored of the line. There's little hunt or chase, just wait a few months if you don't like that Draculaura or want another Deuce. The lack of creativity and edge, for want of a better word, was another. We went from all these cute details ranging from dark to just unique, to just cutesy mostly. With the exception of Fierce Rockers, which felt like old, original MH. Moanica kept the edge going, but she wasn't enough. We went from Dead Tired Ghoulia, for a budget example, who had blood splatter polka dots, brain puffs, her own slippers, brush, card and maybe a stand but I'm not sure never had original DT girls in box but even without a stand, she had so much, to Ghouls Getaway, with no accessories other than their chunky, unpainted jewelry. Looking back, I think 2015 was the year it all went downhill. Except for a few dolls and lines, the rest was a lot more "basic" and cute (Geek Shriek, Ghoul Fair, Ghouls' Getaway, Scarnival and GRS for example). Designer Bootique Frankie came out that year, Draculaura was already looking a lot more cutesy than she did originally, and the Frightmares came out too. Mattel reissued the original ghouls as a pack but the vibe of the brand wasn't the same anymore. I think the first sign for me, was the simplification of the dolls such as when they started to reduce Articulation, Producing mostly Mini Dresses, and shortening the hair. Somewhere between Boo York and Great Scarier Reef. I still loved them. But I had so many dolls at that point I wasn't getting the same kick out of them. Then when G2 happened, it just felt like a natural stopping point for me. Ditto. Towards the end, the lines were being released so rapidfire that I just ignored the super-budgety dolls and reveled in the beautiful deluxe lines (GSR, FdC, Fierce Rockers, Inner Monster, etc.). With G1, I never felt like there was a lack of gorgeous dolls on store shelves. I do feel like the tone shifted somewhat from what it was at launch, but it was never enough to put me off. I guess for me, the most “ick” moment of G1 was when they shifted the tone of the fiction to target younger kids... I really liked the Lisi Harrison books (they were my first introduction to the world of MH, actually! ), and when the “Ghoulfriends” series was released... it was jarring for me. XP Yes, it’s a zany doll line about monsters in high school... but I honestly enjoyed the more realistic setting and the inclusion of/conflict with “normies”. When everyone is a monster, NO ONE is a monster, y’know? I felt like the change to a “Monster World” full of monster-fied versions of real world cities and countries was just kind of... jumping the shark. The return of a more realistic setting is something I’ve really enjoyed about G2, actually. I feel G1 ended when the molds and facial screenings changed. 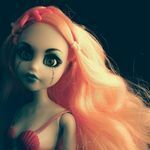 Most the other stylistic changes I feel happened rather slowly and felt like the normal kind of evolving that would happen with any long running doll line. I have both G1 and G2 dolls and really other than the faces, there really isn't any kind of stark contrast between them. Of course I only get the lines that appeal to me and I do feel there's less that do now than in the past but that has more to do with less lines being produced to pick from. Interesting topic! I'd say it was when first less articulated releases appeared. Articulation on MH was a big deal for me, and for a long time, even budget thinbox dolls had full articulation, so for me, G1 ended when full articulation was no longer a universal standrard, eventhough the dolls still had G1 faces and bodies. The last dolls that I was really excited for were GSR and Isi, and even GSR won me over because of the idea rather than the execution. I could deal with the lesser articulation (I was fine with it when it was just certain lines, but it did annoy me when it started becoming an exception rather than the norm ) but when the faces changed, that's pretty much what killed it for me. They just lost all their personality. G1 ended when G2 came along. I agree with Carrehz, the new faces ruined it. But not just that, the themes are all "little girl" focused....insects, fairies (or wings), the ice scream (?) pack, new family members...to me these are all playline Barbie type themes. The molded on items did (and don't) do anything for me. The toned down brightly colored clothes and accessories didn't work either. And the overall "cheapening out" of the whole line was the final straw. I was afraid this would backfire on them, and it looks like I was right, sadly. I still tend to think if they hadn't changed the faces and molds nobody would have noticed a big change in the line. But the drastic facial changes caused people to look at the past more forgivingly and at the present more critically. I apologize about that. I was thinking that some girls might be into bugs, but now I realize maybe that's more for boys? I really don't know. The biggest glaring problem for me is that characters like Ghoulia are missing bc she's too scary (or so I've heard). Spectra is missing but they replaced her with Ari, so I'm not sure why that move was made. Cleo, my fave, is still around but now she has molded wrappings. But that's a personal beef. Lastly, the lack of articulation has been especially disappointing. The little siblings don't have much articulation (although I understand it might be more costly to do so). I was willing to give G2 a chance, and still am...even modified some dolls' eyes so they didn't look so big....but the line now feels more like a variation of Barbie. The creepy cool factor is almost gone. The uniqueness is gone. The whole line has changed. There are hints of creepy cool here and there, but it's not as obvious as it was in the early days of G1. The biggest glaring problem for me is that characters like Ghoulia are missing bc she's too scary (or so I've heard). Spectra is missing but they replaced her with Ari, so I'm not sure why that move was made. As for Spectra, she was criticized for being a gossip, and thus setting a bad example for all the little angels of the world. Wow, remember the stuff The Misfits used to get up to on Jem and the Holograms? I seem to recall them sabotaging the brakes on Jem’s car and almost sending her off a cliff, once. And yet no one demanded the Misfits dolls be changed or removed from production. We sure live in a more policed/censored world these days. I don't know. When I was a little girl I loved bugs. I used to spend hours watching earwigs crawl across my grandmother's patio. And my daughter loves bugs as well. We've caught her playing with wood lice, crickets, carpenter ants, and even an Oriental cockroach. On the flip-side of that: neither my husband nor my brother liked bugs when they were kids. In fact, my husband had anxiety over insects when he was a little boy. To this day he hates bugs, arachnids, rodents, and all reptiles. So yeah, I'd be willing to venture that there are just as many little girls who like bugs as there are little boys, and just as many little boys who are afraid of bugs as there are little girls. I agree with those who have said that it ended when it officially ended. I was never a completionist where MH was concerned (my "gotta catch 'em all" brand was EAH), so there were always characters, lines, and individual dolls that just didn't grab me at all. So I can't say that the brand as a whole ever reached a point where it lost its appeal for me. In fact, I had just started collecting FTGs when the reboot happened. So the dawn of G2 is definitely when everything ended for me. Yeah the Misfits did awful stuff but they were also clearly the villains. But Spectra is ostensibly supposed to be a good guy so she can't have any bad habits. Moanica does some awful stuff and it's ok since she's the villain. I know that there's just as many girls as boys that like bugs. I just mean it's not a typical thing for a doll line to cover. Live as the world is as it should be, to show it what it can be.